I had no idea what to expect when I picked up Hyperion. I had seen Dan Simmons books before- with interesting titles like Illium and Olympos they had always vaguely intrigued me, but I had no idea what to expect when I actually sat down and cracked open one of his books. 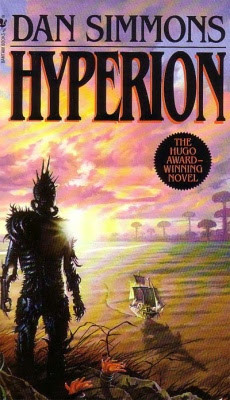 Put it this way, if you've ever had that dangerous, snobbish thought that 'science fiction isn't real literature' well, you need to go and read Hyperion. Because it's not just good science fiction, it's genre bending, excellent literature, packed full of references to religion, classic literature, poetry- so many it made my head spin at various points. When I finished this, I almost, almost ran to Wikipedia to spoil the sequel for myself, but I turned away. I made myself wait. Because as with all good literature and great books, I can't wait to see what happens next. In the far future of the 27th Century, humanity has spread across the galaxy with a core of worlds being connected through a 'farcaster' network which permits instantaneous travel and other worlds, not connected to the main 'World Web' being reachable by spaceships and thus subjecting travelers to time dilation or 'time debts' that are accrued using this slower method of travel. Higher technology of the 'Hegemony of Man' is run by the TechnoCore, a group of AIs that live apart from humanity and (it is revealed) have obsessions and agendas of their own. Outside of both the Hegemony and the TechnoCore, you have the Ousters space based 'barbarians' that live at the fringes of explored space and have, over the centuries gone to war with the Hegemony. Now, the galaxy stands at the brink of war once more- this time, everyone seems to be converging on the mysterious world of Hyperion where the inexplicable Time Tombs (which are moving backwards in time) stand and where the mysterious Shrike lives. There's a whole cult/church following of the Shrike and pilgrims in groups of prime numbers set out to seek audiences with the Shrike and, tradition states all but one of the pilgrims are slaughtered and the remaining one is granted a wish. Now, one final journey has been granted before the war begins and seven strangers are thrust together. To pass the time on their journey from their space ship to their meeting with the Shrike, they each tell their story and one by one each reveals their reason for coming back to Hyperion and what they hope to learn from the Shrike. After the tales are told, the book ends with the reaching the valley where the Shrike lives and heading down to find out what happens next. Looking into this book a little more, you find that Chaucer's Cantebury Tales and the Decameron were influences on the structure of the book (both have different tales from multiple travelers/characters that interlock to tell a story) but while that deals with the structure, each tale of the pilgrim also occupies a different genre/style of writing that makes reading this book an amazing experience. The first tale, 'The Man Who Cried God' is about the Priest, Lenar Hoyt and his journey to help his mentor, Father Paul Dure- that one seems to going one way and then turned and heads in the direction of horror. 'The War Lovers' feels like military science fiction, 'The Poet's Tale' is more autobiographical, 'The Scholar's Tale' is the story of a family dealing with a devastating disease, 'The Long Goodbye' feels like a hard bitten noir detective novel and 'Remembering Siri' feels like a tragedy/romance. It's amazing how effortless the tone of each tale shifts as you move through the book and the various tragedies and loves of each character feel incredibly real, despite the fact that you only really get to know them for one portion of the book. I have no idea what happens next... I've got a few books I've got to get through before I get back to the library again, but when I do, I hope it'll be to pick up the sequel to this book, The Fall of Hyperion.